I’ve been looking for a natural way to whiten my teeth. I don’t like the idea of using chemicals. I keep reading you can use lemons or lemon essential oils to whiten them. Have you seen this work with your patients? I use lemon essential oils in my cleaning regimen but I’d never thought of using it on my teeth. 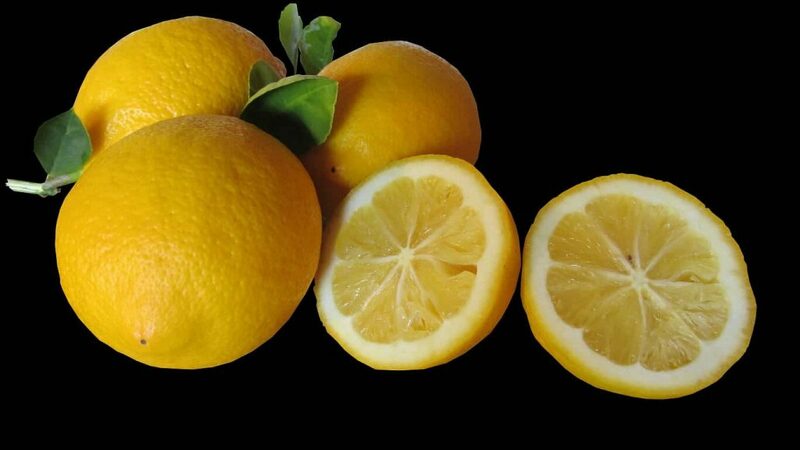 Lemons are commonly touted as a DIY tooth whitening agent, but is it safe? You will find these types of things on lots of natural websites. While you can brighten your teeth with lemons, I wouldn’t recommend it. Think about the fact that you use the lemons to clean around your house. This is because of the citric acid. Citrus is used in most cleaners, even oven cleaners. The reason for that is it not only kills bacteria, it’s corrosive and eats away at the mess. It will do that to the enamel on your teeth. The erosion of your enamel not only leaves you susceptible to decay, it also allows them to pick up stains more easily. I know you’re worried about chemicals, but even the lemons are made of chemicals. The peroxide used in the teeth whitening gel is proven safe for patients. It’s also perfectly safe for your tooth enamel. 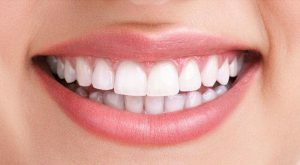 At-Home Teeth Whitening: This is done with custom fitted trays and whitening gel which your dentist will provide for you. This biggest benefit to this type is you can control the level of whitening you achieve. Once you get your teeth the whiteness you want, you just stop wearing the trays. In-Office Teeth Whitening. This is often called Zoom Whitening because that is the brand most dentists use. The benefit to this option is you get your teeth completely white in just one appointment. I read an article which talked about whitening your teeth with charcoal. I know you can’t believe everything you read so I wanted to get a dentist’s take on it. Will that work? If so, is there anything I need to know to make it more effective? You are a wise woman to verify the things you read. Too many people take anything they read or hear on the news at face value. I’m very glad to know there are people like you around. As to your question, I first want to qualify that when they talk about charcoal for whitening teeth, they aren’t referring to the type of charcoal you use to grill your food. Instead, they’re talking about activated charcoal. The popularity of DIY teeth whitening is growing, especially using charcoal. Let me go over the most common claims about the method and tell you which are true and which are false. It is non-toxic and safe to ingest. It’s also natural and has some medicinal uses because of its absorbancy. A growing number of people use it as a detoxifier. Because of that, many patients think it’s ideal for whitening their teeth. That leads us to the next claim. Everything has an abrasiveness level. Unfortunately, the abrasiveness of charcoal is too hard to use on teeth. It will scratch your enamel, leaving little grooves where your teeth will begin to pick up stains much more easily. This has the opposite effect of what you’re hoping for your teeth. It can get rid of some stains while it works its abrasiveness. It is also absorbent and will soak up some surface stains, but toothpaste and a toothbrush can get rid of those same stains. 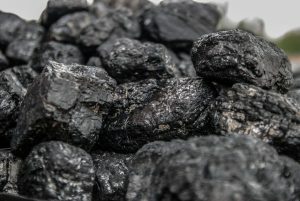 The biggest problem with the charcoal is the damage it does to your enamel. Once the enamel’s gone, that’s it. It doesn’t come back. Your teeth will do nothing but constantly pick up stains. In all honesty, the best option you have for effective tooth bleaching is to do it with a dentist. The peroxide gel the dentist uses is also natural with the added benefit of it being perfectly safe for your teeth. While with some cosmetic procedures, such as a smile makeover with porcelain veneers, you’d need to have an expert cosmetic dentist, with teeth whitening you can just use your regular family dentist. I keep looking for natural ways to whiten my teeth. One thing everyone on the natural health sites seems to tout the benefits of apple cider vinegar for many things. I recently read it can naturally whiten your teeth. Is that true? Or is it a waste of time? I’m sure nature has a safe way for us to whiten our teeth, but we haven’t discovered it yet. The problem is, while most of the natural methods which are recommended for whitening your teeth can brighten them, they also destroy them. Along with apple cider vinegar, you’ll read a lot about both lemons and oranges being used in that capacity. The problem is, the fruits contain citric acid and the vinegar contains acetic acid. They will definitely kill bacteria, which helps to clean and brighten them. At the same time, the acids eat away your dental enamel. Once enamel is gone, it’s gone. That’s it. You will forever be battling the loss of your enamel. That will mean increased decay. Not to mention increased tooth sensitivity. So far, the only safe way we have to whiten teeth is using oxidation. You can do it professionally or by using over the counter products, such as Crest Whitestrips. While the Whitestrips seem more cost friendly, their strength is significantly weaker than what you’d get with your dentist. This means purchasing many more boxes in order to achieve what you could through professional teeth whitening. It’s also helpful to be under the care of a dentist in case of complications, such as gum sensitivity. There are also other things to consider. If you have any dental work, such as porcelain crowns or dental fillings, they will not whiten. No matter what method you choose, teeth whitening only works on natural tooth structure. If any of your dental work is visible, you should plan on replacing them after you achieve the level of whitening you want so they’ll match. If you just want your teeth as white as possible fast, many dentists have an in-office whitening system, such as Zoom Whitening, which can get your teeth as white as possible in just one appointment. I’d recommend waiting a week for the color to settle before replacing any dental work though. Another option is whitening trays you can use at home. They’re custom fitted to your specific bite. Your dentist gives you a gel to go with them. You wear them for a minimum of 20 minutes a day until your teeth are the brightness you want. I’ve always done my best with my smile. When I didn’t have any money, I was diligent to brush and floss regularly and never drank coffee and other drinks which could stain my teeth. Once, my finances were a little better I started whitening my teeth about every two years. Now, I can finally do a full smile makeover. I’m was so excited about this…until they came in. The porcelain veneers are darker than my natural teeth. I don’t understand how and neither does my dentist. He said he gave me the whitest shade available. He didn’t put them on because he could tell I was disappointed. He said he’d do some research and get back with me. I think maybe because he’s been in the industry for decades, he hasn’t kept up very well with the changes. Is it possible to get this to match my teeth or do I just have overly white teeth? Believe it or not, the answer to both your last two questions is yes. While it may be that you have overly white teeth (and many people do these days), you can still have porcelain veneers made white enough to match your natural teeth. I’m sure your dentist is a lovely family dentist and has always served you well. Your suspicion of him not keeping up with the industry could be right. Or, maybe he keeps up well with the portion of the industry that he focuses on. Cosmetics might not be his thing. It doesn’t mean you’ll have to switch dentists. It means you may have to go to a different one for specific cosmetic work. Though, because he’s willing to go back to the drawing board for you. I can tell both of you exactly what happened. 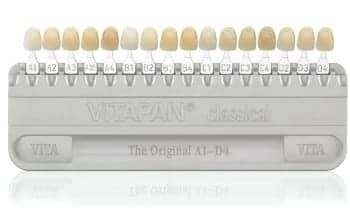 This is the Vita shade guide that most dentists used to match crowns to the natural color of their patient’s teeth. As you can tell, none of them are the exceptionally white teeth we’ll see today. That’s because natural tooth structure is being whitened beyond the white that was the standard tooth color. As you can see, the shades on the left are significantly whiter. 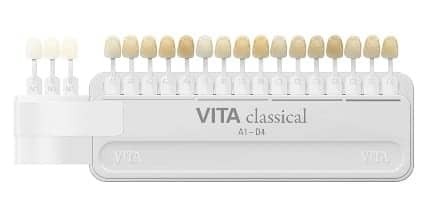 This is what your dentist would need to use to match your natural tooth color. It’s very likely he did the whitest shade available for the non-cosmetic tooth shading. If you liked how the porcelain veneers looked with the exception of the color, give him another shot. You may want to share this information with him. It sounds like he cares. Many inexperienced cosmetic dentists will just try to convince you that it’s beautiful or make it sound like you’re being unreasonable. He’s already got the most important characteristic of a good cosmetic dentist. He cares about how his patients feel about their smile. Teeth Whitening Store Has Me in Agony. I’m in complete agony and am too embarrassed to call my dentist. I’ve wanted to whiten my teeth for a while, but am a broke college student. So, as you can imagine, what my dentist quoted wasn’t feasible for me. I was at the mall and saw a teeth whitening store. I was curious if they’re the same price so I wandered in. The girl seemed super helpful and knowledgeable. They were half the cost of my dentist and she was even a certified teeth whitening specialist, so I felt safe doing it. I went back the next day and they used this gel and lamp. I was (and still am) in complete agony. My gums are on fire and my teeth look dark everywhere I have a filling. I feel like I need to go to the doctor about my gums, but what do I do about the fillings? Wow! Corra, what a disaster. I want to start with the pain you’re in. It sounds like they didn’t put a protective covering on your gums and it came into contact with both the whitening gel and the light. That’s a huge mistake they made. Essentially, what you have is equivalent to a sunburn on your gums. I don’t think a doctor will be able to do much. Saltwater rinses might speed the healing. Also, don’t hesitate to take some pain reliever. You should know two things: 1. There is no such thing as a certified teeth whitening specialist. That’s likely just an in-house term they use after they teach their employees the procedure to make them sound qualified, but as you can tell they aren’t. 2. Never be embarrassed to talk to your dentist, even when you feel you’ve done something stupid. Though, in this case, it wasn’t you being stupid as much as misled. Dentists have heard it all and need to be aware of places putting patients at risk, which this mall company did with you. Another mistake this company did is not warn you about your fillings. Teeth whitening only works on natural tooth structure. That goes for whitening done with your dentist as well, though he would have informed you. When you have visible dental work, such as porcelain crowns or fillings, etc., the surrounding tooth structures will whiten but the other work will not. Most patients go ahead with the whitening and then have their dental work replaced to match it. After your gums have had time to heal from the trauma they’ve undergone, contact your dentist. He or she can replace your fillings with beautiful white fillings that will match the new color of your teeth. It wouldn’t hurt for you to have him look at your gums and make sure no permanent burn damage has been done. Also, make a note to the Better Business Bureau about this place and leave a review, so other unsuspecting people aren’t injured. This blog is brought to you by Dr. David Newkirk. Can You Damage Enamel By Whitening Your Teeth Too Much? The first time I saw my wife, she was covered in mud from head to foot from a powder puff football game played in the rain. The only thing not caked in mud were her teeth. Let me tell you, her smile was radiant. I fell instantly in love. I’m still in love with both her and her smile to this day. I say that as a preface because I’m worried she whitens them too much. She had zoom whitening done three years ago. But, every six months, after her cleaning and check-ups, she purchases more gel and does a touch-up at home. Will that damage her enamel or is it safe? A beautiful smile can melt hearts. While I do understand your concern about your wife’s whitening habits, she’s actually fine. Generally, when people do “touch-ups” it’s only about once a year. However, if your wife has habits that can stain her teeth more often, then twice a year isn’t horrible. Drinking things like coffee or tea will tend to mean you need to whiten your teeth more often. There are foods like curry that can stain teeth as well. However, sometimes whitening more often sabotages your efforts. Our teeth have microscopic holes in them. When we whiten our teeth, those holes open up more. Eventually, they close again. But, until then she could be more susceptible to stains. There are warning signs when someone is whitening too much. One is sensitivity. The other is her teeth will start to look translucent. However, if these were happening, I don’t think her dentist would continue selling her the gel. She gets regular check-ups, so he’d notice any detrimental changes in her teeth. If she’s interested in a more permanent way to keep her teeth looking perfect, your wife may want to look into porcelain veneers. This is something people tend to get when they’re looking for a total smile makeover. But, the porcelain is much more stain resistant than her natural teeth so she would not have to whiten anymore. One word of caution. While any dentist can do a great job with teeth whitening. A smile makeover with porcelain veneers requires both expertise in technical skill and artistry. Finding an expert cosmetic dentist can be tricky. I’d recommend you check on the mynewsmile.com website to see who they recommend in your area. I have a dental crown. For the last few years, it’s been whiter than my teeth. I drink a lot of coffee, so the natural assumption is the coffee’s been staining my teeth, but not the crown. I decided to whiten my teeth. It worked. My teeth look much whiter and brighter now. The problem is they’re whiter than the crown now. My dentist thinks everything looks fine, but said we can change the crown if I’m not happy. I’ve tried just getting those over the counter Crest Whitestrips, cutting them to fit the crown, but they’re not whitening. Would getting a round of professional whitening just on the crown work? Your dentist has done you a grave disservice. He should have warned you that dental work does not respond to teeth whitening, even professional teeth whitening. It’s his responsibility to let you know the pros and cons of every procedure. The Crest Whitestrips aren’t ineffective because they’re over-the-counter. It’s because you’re expecting them to do something not even the whitening your dentist does can accomplish. The one thing your dentist is correct about is the solution. If you want the crown to match your teeth, it will have to be replaced. I’m assuming because the color difference bothers you the crown is on a front tooth. If that’s the case, you’ll want them to place an all-porcelain crown. They’re more translucent than their metal-based counterparts. That enables them to look just like your natural teeth. It’s disappointing your dentist didn’t warn you about this ahead of time. It’s teeth whitening 101 so he must have known. That’s put you in the unfortunate position of having to spend more money to get your smile to match. If you stay with this dentist, just let this be a lesson to you to ask every possible question you can think of. What worries me about that is, as a patient, you don’t always know what questions to ask. He should be giving you the information you need, unspured. Can Whitening Trays Sub for Retainers? I lost my retainer. I don’t get paid for another week and a half. There’s no money in my account. There’s no way I can get a new retainer until I’m paid. Even then I won’t have all the money. Can I use my teeth whitening trays instead? Unfortunately, teeth whitening trays won’t work. They’re designed to be soft and flexible, not hard like retainers. You don’t want your teeth to start shifting, and they will. It’s hard to know how long it will take them to start shifting. Everyone’s mouth is a little different in that aspect. I’d suggest just talking to your dentist about the situation. I’m sure he’d be willing to make you another one and bill you, especially under the circumstances. If he or she is unwilling, then there’s not much else you can do. Hopefully, your teeth will give you some time before shifting. Can I whiten just one tooth? I have a crown on one tooth. It has started picking up stains. I have had it for quite some time, so that’s not suprise. I don’t want to pay to whiten all my teeth, just the crown, but wondered if you can just whiten one tooth? When you whiten teeth, you whiten an entire arch. However, you’re not asking about a natural tooth. You’re asking about a dental crown. Unfortunately, even if you had an entire arch of dental crowns they wouldn’t respond to teeth whitening. It’s only effective on natural teeth. The best solution, especially given the age of the crown, is for you to get it replaced. My suggestion would be to get an all-porcelain crown. They look much more natural than the metal based counterparts. If you’d like your teeth whitened in addition to getting your dental crown replaced, be sure to get your teeth whitened first. The have the new porcelain crown made to match your teeth. I have a friend with really white teeth who says she does it herself by gargling with clorox bleach. Is this safe? It seems to work for her. People sometimes get confused about teeth whitening. They hear that dentists bleach teeth, and think that the clinics use acctual bleach. In reality, dentists use a very specific peroxide solution, that is too strong to be done over the counter. While I’m sure your friend’s teeth are quite white, bleach is a corrosive. It’s also quite damaging to living tissue. Plus, because it is a base (as oppossed to an acid) there are certain things you might put in your mouth that will react with the clorox. It release a toxic gas, which can kill you. The safest thing to do is go to a dentist for your teeth whitening. There are a lot of affordable ways to do it.